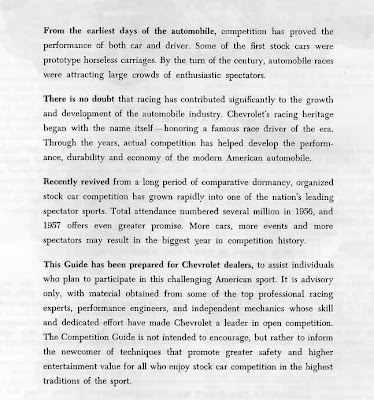 The next page in the Guide is pretty much an introduction to the Guide itself along with Chevrolet's reason(s) for creating it in the first place. 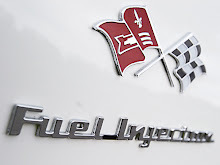 In it Chevrolet states that the Guide is simply 'advisory' in its premise in order to help Chevrolet dealers cope with the growing demand for '57 Chevy stock cars. The guide was not intended to 'encourage' people to race but rather to 'inform' them 'of the techniques that promote greater safety and higher entertainment value for all who enjoy stock car competition in the highest traditions of the sport.' See picture below. End of Part 3 ... Part 4 is in the works and will be out soon!